Can you believe we are officially in the Holiday season? While I’m not putting my tree up yet, I am out shopping for Holiday decorations and hunting for presents. If you’re like me and already tackling a giant shopping to-do list, you’ll be excited to hear that Cost Plus World Market is hosting a Golden Bell Scavenger Hunt. This is a chance to find a Golden Bell in store from November 1 to December 9, where you could receive a $10, $20, $25, or $50 reward! If you remember last year’s treasure hunt, you know how much fun this will be. Cost Plus World Market is giving away over $1.8 Million in total rewards this year and is hosting 2 games a day for a chance to find one of 8 Golden Bells. Game 1 gives you a chance to find one of 4 Golden Bells hidden in the store from open to 3 pm. Game 2 is another chance to find one of the 4 Golden Bells from 4 PM to closing. So when you’re looking to tackle that shopping list after work, you still have a chance to play the game! Grab more game details and the first Golden Bell clue down below. The Golden Bell Scavenger Hunt is played every day beginning Thursday, November 1, 2018, through Sunday, December 9, 2018. Your local Cost Plus World Market will hide 8 Golden Bell pieces throughout the store. 4 Golden Bells from store open to 3 PM. 4 more Golden Bells from 4 PM to closing. Each day, we’ll share a daily clue in-store, via email, and on our social media channels to help you find a Golden Bell piece where you could receive a reward. Find (1) Golden Bell and bring it to the nearest store associate to exchange for a reward coupon worth $10, $20, $25, or $50. The reward is valid only on the day it is awarded. Limit (1) reward per person throughout the Promotion Period (11/1/18 – 12/9/18, regardless of store location(s) visited. EMPLOYEES and DESIGNATED SHOPPERS NOT ELIGIBLE. To get you in the scavenger hunting spirit, I’ve rounded up 10 Must-Have Gold Holiday Decorations from Cost Plus World Market. Every year I try and pick a theme for my Holiday decor and this year I’m going for a “Dusted in Gold” theme. 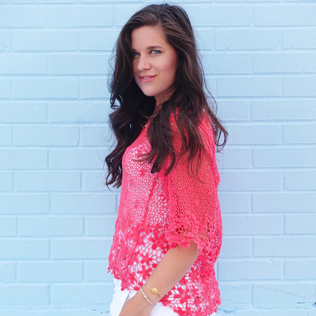 I’m thinking shades of white, layers of gold, and sparkles. You can find all of these gold decor pieces linked below. 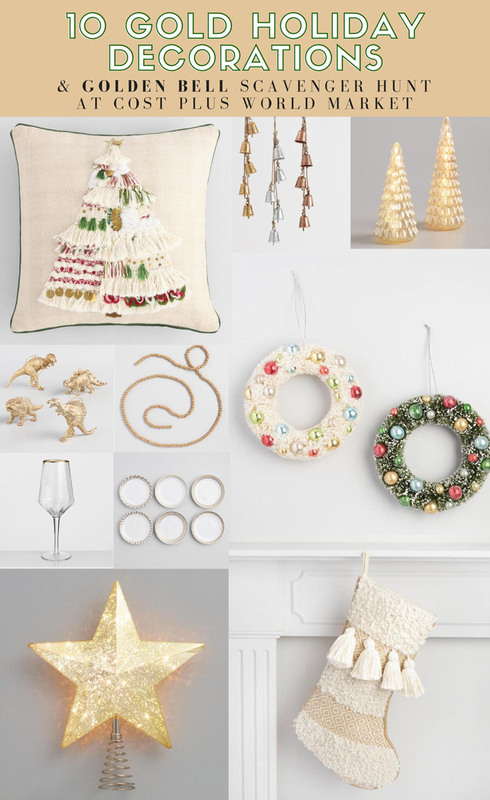 Personally, my favorites are tied between the shimmery gold threaded stocking or the dinosaur gold ornaments that would be the perfect whimsical touch to a tree. What is your Holiday decor theme this year? 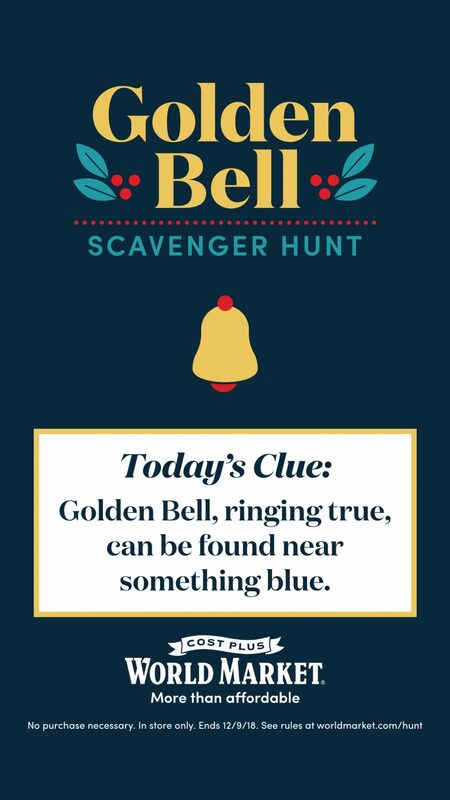 Tell me in the comments below and make sure to share this post so all your friends can get in on the Golden Bell Scavenger Hunt this Holiday season. 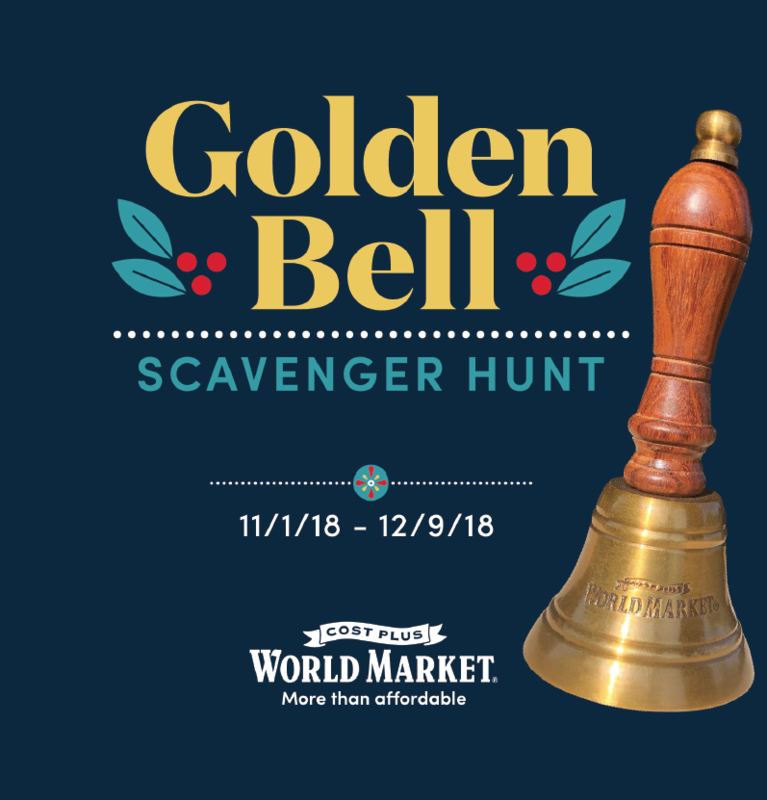 I know I’ll be looking forward to going to my Baybrook Cost Plus World Market to shop this Holiday season and see people play the Golden Bell Scavenger Hunt. 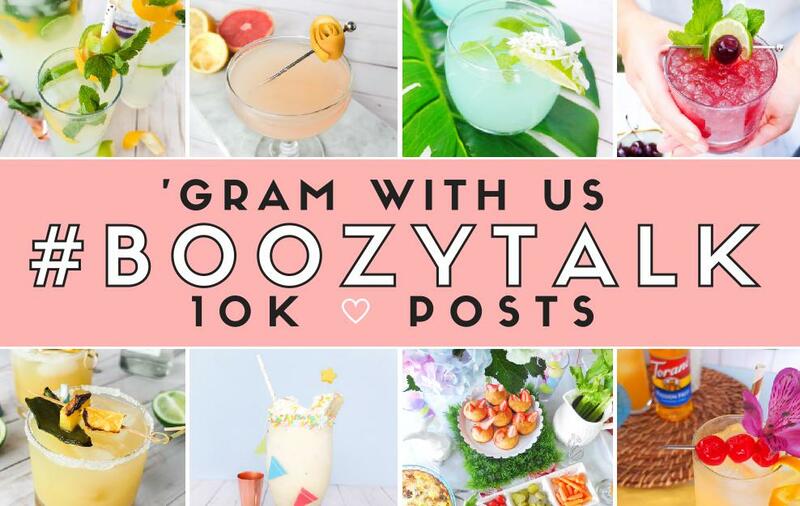 You can find your store to participate at here.